Senior Cats - When It Is Time to See the Vet? Regular veterinary examinations are important for overall health at any age. Annual examinations are the norm, but more frequent exams may be needed, based on your pet's health. 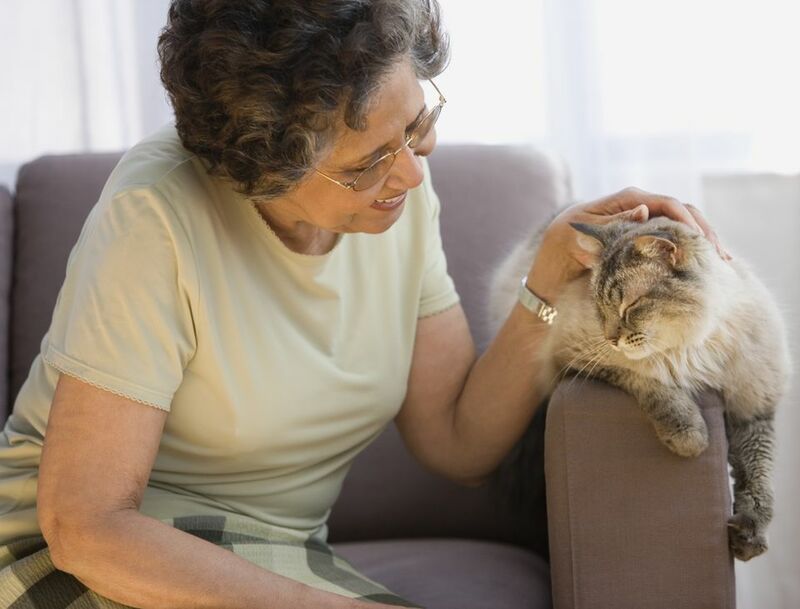 As a cat ages, it may be easy to chalk up a new behavior or health issue as "just old age", but be on the alert for new behaviors and activities (or lack of activity) - these can be clues to your cat's overall health. Change in appetite - Any change in appetite - eating less or eating more - should be checked out by your veterinarian. Many illnesses can cause a loss of appetite. A fairly common age-related disease of cats that can cause an increase in appetite is Hyperthyroidism. This condition is caused by a tumor of the thyroid gland, which is benign 98% of the time. Cats can exhibit many signs with this condition, including, but not limited to: weight loss, increased appetite, vomiting, increased heart rate, increased activity levels. Change in urine output and thirst - Cats should not drink more water simply because they are old, it is summer time, or the heater is on in the winter. The most common causes of increased water intake are kidney disease and Diabetes Mellitus. Urine leakage or having "accidents" out of the box also signals problems, either with infection, loss of sphincter control, or ​another underlying disease. Arthritis pain - There are many medications available today to help ease the pain and discomfort of arthritis. See your veterinarian to discuss what medication is right for your pet. Sudden blindness, hearing loss, head tilt / staggering - These signs can be seen with a variety of causes - infection, poisoning, age-related, cancer, etc. and your vet should be consulted to find the cause and begin any necessary treatment. Note: some cats can develop cataracts in just a few days, with sudden onset diabetes. See your vet as soon as possible. Cognitive Dysfunction - Cats, like people, can experience age-related dementia. There is a veterinary medication for dementia available that may help some cats. Most of the studies and data on this condition and medical treatments for it are for dogs, but information on cats is available, too. This list isn't all-inclusive. If your cat is "not himself or herself", then it is time for a check up at the veterinary clinic! How can I keep my pet more comfortable in his senior years? Provide a comfortable clean bed - there are many "orthopedic" beds available now at pet supply stores to ensure comfortable rest. Provide fresh water daily (note changes in water consumption) and a healthy, age-appropriate diet. Ease distractions - senior pets can be easily startled by or become fearful of: kids, loud noises, and general commotion as they age. Conditions such as arthritis can make the cat fearful of getting hurt (or the potential to get hurt) with sudden movements of kids or being stepped on. My senior cat has been drooling. Could it be a bad tooth? Anipryl® - Help for Senior Pets?